I am always in search of the tough, resilient plants that stand out in any challenging landscape. Certainly, ornamental grasses fit into this category. They are increasing in popularity because of their texture, form/structure and interesting seed heads. Another reason their popularity continues to grow is that they require minimal care and provide year-round interest. Ornamental grasses are a diverse group of perennials that expand the plant palette of any design, but many of them get too tall for a typical landscape application. This Blue Grama Grass is apparently on steroids. I cannot believe how vigorously it grew this year, ultimately reaching two feet tall. This taller form has bright blue-green leaves that are topped by a host of eyelash-like golden yellow flowers. They wave in the wind and ambitiously last from summer into the fall and winter months. I used it along a walkway but it is so attractive that it could stand on its own providing many months of ornamental interest. 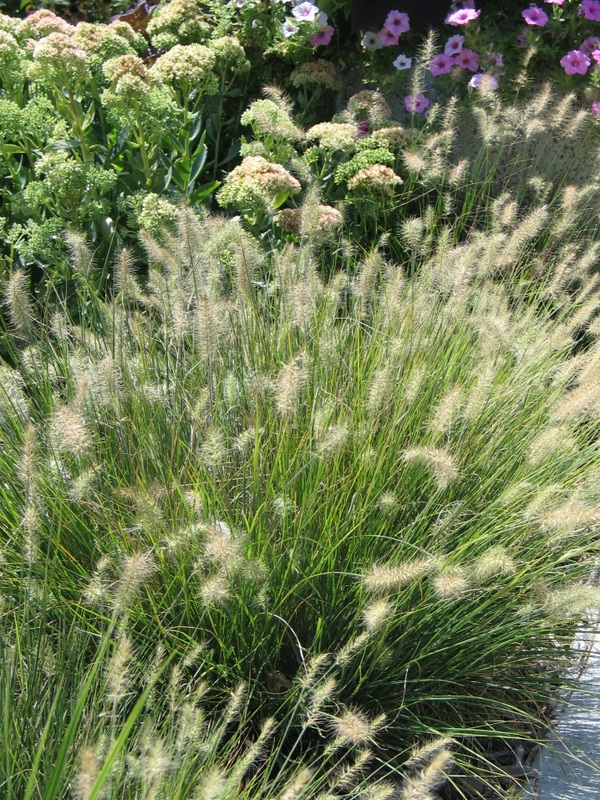 This beautiful grass was discovered by David Salmon of High Country Gardens. At one time, this was the top selling native grass in the country. To see a mass planting in full bloom, you can understand why it is so popular. The narrow leaves form a perfect fountain of green. In late summer, the fragrant airy seed heads develop. Some liken the fragrance of the blooms to buttered popcorn. With this plant, you can get your theater popcorn fix without all the calories. It requires almost no maintenance once established. 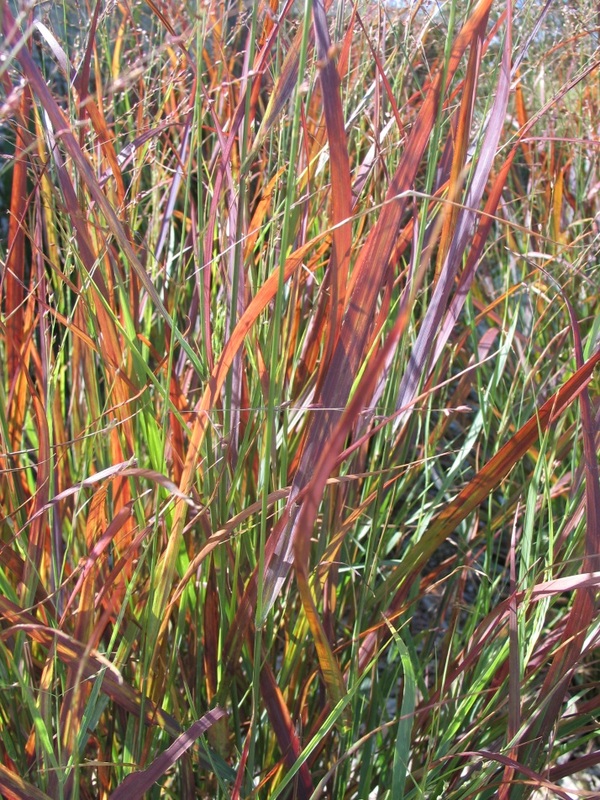 Fall color is burnt orange and rivals Little Bluestem in mass plantings. 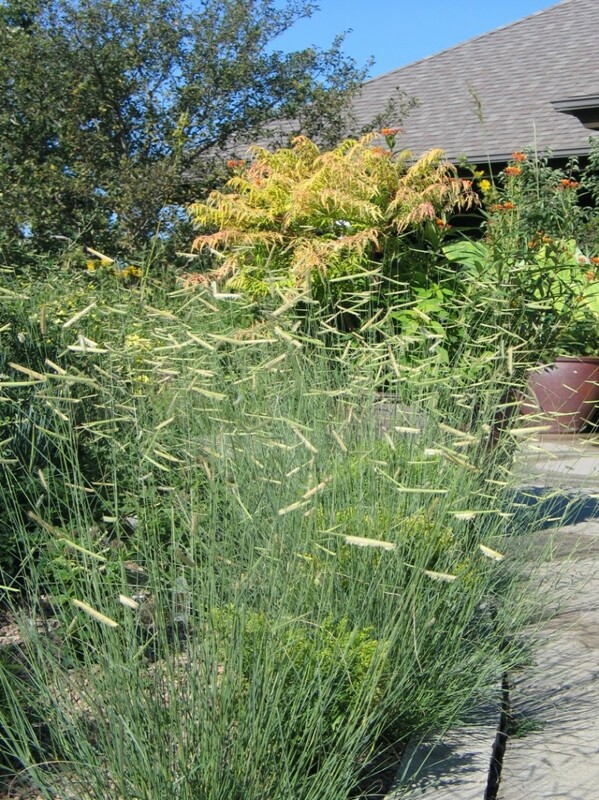 A shorter form of Prairie Dropseed worth trying is the variety ‘Tara’. WOW! This grass is spectacular this year. They are totally saturated in reds and purples. Most switchgrass varieties get four to five feet tall, but not ‘Cheyenne Sky’. It forms an upright three foot clump. The vibrant red color hues begin to develop in early summer followed by reddish flower clusters in August and September. The leaves rustle with the slightest breeze and sway in the wind adding movement to the garden. I use it in containers, groupings or as a specimen plant by itself. It is a very versatile and beautiful grass. We have been thrilled with this miniature fountain grass. It puts on a show during the summer when the tiny cream seed heads pop up over the cascading green leaves. The seed heads resemble little bunny tails, hence the name. We have found it to be a reliable performer in the perennial borders and when planted in mass. If you have limited with space, then this grass would be a great choice. 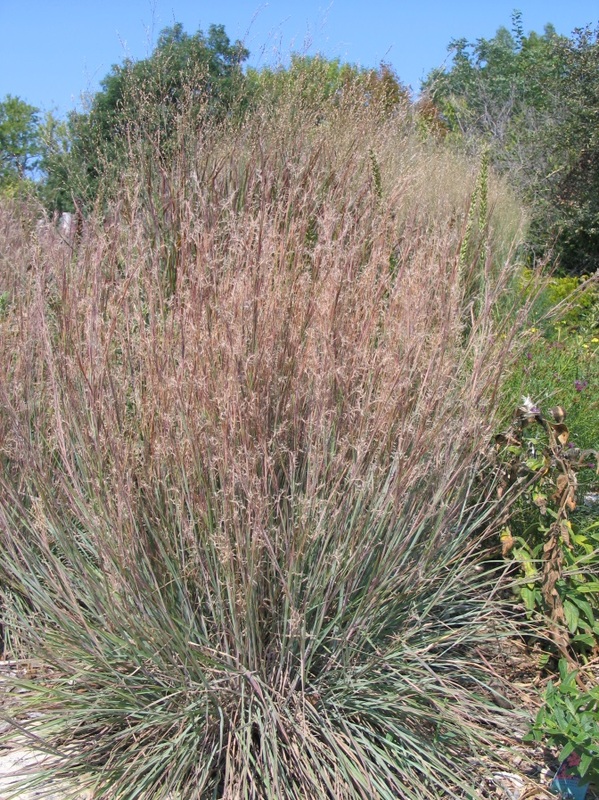 Questions: Which of these grasses have you tried in your landscape? What steps do you need to take to integrate more grasses into your garden? On a recent trip to the Rocky Mountains, I visited the Denver Botanical Gardens. My family rolls their eyes because we always visit some garden while on vacation. They usually have a good time once they are there but their short attention span makes me hustle through the gardens. Anyway, I noticed some interesting native plant displays that I want to try at the arboretum. Under some cottonwood trees were strategically placed shorter native plants. Essentially, they were mimicking a savanna landscape which is the transition zone between open prairie and forest. 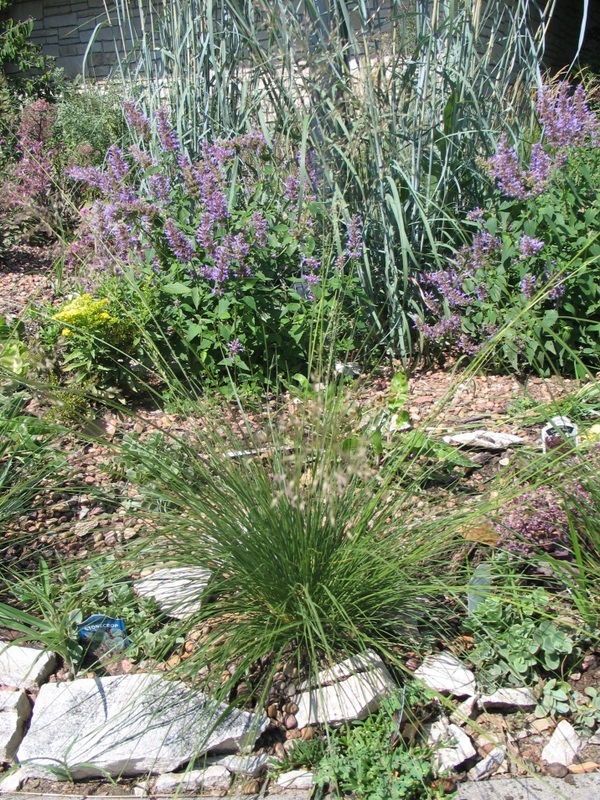 The plantings were diverse with grasses and perennials. One of the many things that caught my eyes was how the plants were grouped. It made such a visual impact. Blooming perennials popped while the grasses offered texture and soft forms that blended the planting together. A small trail weaved its way through the entire landscape allowing visitors to get up close to the plants. The grasses they used were blue grama, little bluestem, side oats, and prairie dropseed. The wildflowers included purple poppy mallow, four o’ clocks, columnar coneflower, penstemons, coneflowers, indigos, asters, blazing stars and goldenrods. This display is totally scalable. By grouping at least five plants of a particular species together, they stood out in the garden. The grasses were used to line the path and edges but also were used as a backdrop to highlight the blooms and seed heads of the wildflowers. Grouping these individual species together makes it easier to weed, water and maintain. We have been experimenting with this group approach at the arboretum with great success. A limited palette of wildflowers that bloom at different times of the year combined with grasses in artistic ways can have a tremendous visual impact. Try spring bloomers next to those summer or fall blooming perennials. A little forethought before planting, matching the plants with your site, grouping species together, properly planting and establishing will go a long way to creating the effect you want in your landscape. I have found with natives that “less is more”. What plants or landscapes have you seen in summer travels that you would like to try? 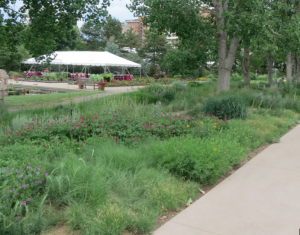 This is the beginning of a blog from the Dyck Arboretum of the Plains about native and adaptable plants, why they matter, how to utilize them in a landscape, and the beauty of the prairies. We want to have conversations and provide you an opportunity to share your thoughts and opinions about gardening and landscaping in harsh climates. This blog will provide you with valuable information to help you in your endeavors. The right information and the right perspectives can make all the difference in your own landscape. Aldo Leopold stated, “A thing is right when it tends to preserve the integrity, stability, and beauty of the biotic community. It is wrong when it tends otherwise”. Conservation of native plants and how to integrate native and adaptable plants in beautiful, artistic ways into a home or business landscape. I will share my 17 years of experience as Horticulturist at the arboretum with you. Hopefully, my successes and failures can help you along the way. I have killed plenty of plants over the years. I have also learned a few principles that make beautiful gardens. This new platform is a great way for us to learn together. You can help me and I can help you become better stewards of the land. Someone once said, “If it was easy it would be called growing, not gardening.” Maybe we can make it easy for you and for me. How do you use native plants in your landscape? What plants have you had success growing?